This Crossroads GPS project, though, is built upon a profound incongruity. The conservative organization is championing accountability and openness, yet it does not disclose the well-heeled funders and special interests underwriting its own efforts to shape the political system….NBC News reported that a “substantial portion of Crossroads GPS’ money came from a small circle of extremely wealthy Wall Street hedge fund and private equity moguls.” Crossroads GPS is the poster-nonprofit for secret campaign mega-money….But now this secretive organization is deploying the issue of open-government to assail the Obama administration, which has a better record on openness issues than previous administrations. I don’t really see this. 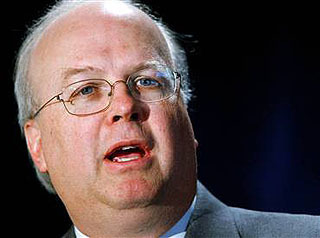 Rove runs a private group that’s not required to release information about itself. The federal government is a public institution that is supposed to release information about itself. Even if Crossroads GPS were required to divulge its major donors (a good idea, I think), it would still be able to keep the vast majority of its inner workings confidential, and rightly so. It’s just not comparable to a government agency that works for the public. So I guess I’d absolve Rove of any serious hypocrisy here. So far, though, his new project does seem to be trafficking in both idiocy and inaccuracy, which is a little harder to defend. David has more about this at the link. Still, if Rove wants to keep an eagle eye on the Obama administration in order to gain partisan advantage, I can’t complain. Who’s going to keep a better watch on possible government corruption than political opponents, after all? It’s the idiocy and inaccuracy, which I have no doubt are going to continue, that are harder to take.